A prisoner of the Temple of Time who was locked up after committing an atrocious crime. It should've received a much more severe punishment for what it did; however, Goddess Rhinne was considerate of the fact that Lyka was born evil and that it would be unfair for it to bear all of the responsibility. So instead, Rhinne decided to lock it up inside the Road to Oblivion so that the flame of oblivion can burn away its evil heart... 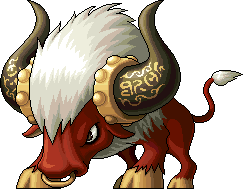 However, even after all these years, Lyka's vile nature still remains, making the Temple Keeper tremble in fear.